FARCE. The City of Hambaloney has rats! Lots and lots of rats! But the mayor and city council voted to give themselves raises last year, so the city coffers are empty. Desperate to rid the city of rats, a city council member contacts a weird flute-playing guy, the Pie Piper, who lives in a cave outside the city. 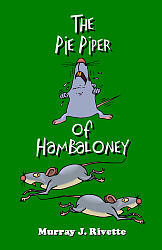 Not only is the Pie Piper the cousin of the infamous Pied Piper, he works real cheap…as in no money. All he wants is one pie a day for a year. After the Pie Piper drives the rats away with his horrendous flute “music,” the mayor discovers that all the bakers have left for a pie convention and there are no pies anywhere. To get back at the town officials, the Pie Piper lures all their children away. The only problem is that the citizens of Hambaloney aren’t sure if they want their kids back!